Bob and Diane Lazier first came to Vail Colorado on their honeymoon during a bitter cold snap in January of 1963 – the first ski season of Vail’s existence. They were enticed by a brochure of the fledgling resort left by legendary Vail marketing guru Bob Parker in the Minneapolis ski shop where Bob Lazier worked. The Lazier’s honeymoon turned into a lifelong passion for each other and for Vail. They worked various Vail Colorado hotel jobs at the Vail Village Inn those first few years cleaning rooms, serving coffee, washing dishes, tending bar, and listening to and learning from the builders who stopped in for drinks after work each evening. In the tradition of the pioneering early days of Vail, the Laziers scraped together enough money to buy their first lot in Vail Village for $7,000, taking a chance and building an eight-unit apartment. That led to a building a year for the next decade, including the Arcade Building in Vail Village, the Wedel Inn where the Sonnenalp now stands, and the old Tivoli. 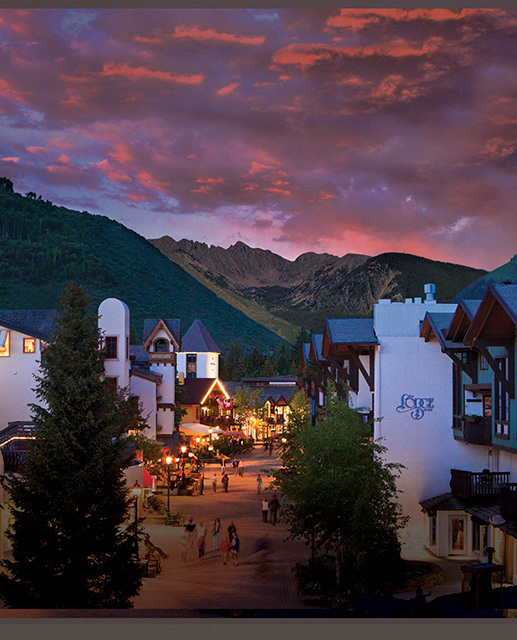 The Lazier’s have watched Vail Village grow from a sheep pasture with a few buildings and a couple of lifts, to this world-famous and world-class resort. And now they get a chance to see their children and grandchildren become a part of the next great era in Vail history.You can see this family tradition throughout our Vail lodging. Brown Hound Lounge, for example, offers up a bountifully stocked bar and its signature Indini cocktail – inspired by our Vail Colorado hotel mascot Indy, the brown hound for whom the lounge is also named. Indy was named for the Indianapolis 500, the legendary auto race won by Bob and Diane’s oldest son, Buddy, in 1996. Both Buddy and younger brother Jacques still race in the Indy Car series. Started as one of Vail’s first great European-style lodges in the 1960s, Tivoli Lodge in Vail Village has been reinvented from the ground up as an ultra-modern model of boutique luxury Vail Colorado hotel accommodations in Vail. Re-opened in 2006, the Tivoli Lodge in Vail Colorado is still steeped in old-world charm and suffused with Tyrolean tradition, ambiance and hospitality.